​In Part One of our three-part series on the making of Mr. Bug Goes to Town, we looked at the creation of the Mr. Bug story-line. After months of developing and discarding a variety of concepts, the studio finally had a wholly original story-line. Set in the modern era, Mr. Bug Goes to Town involved an entire colony of anthropomorphic insects, a city full of humans, and the towering landscape of New York City. 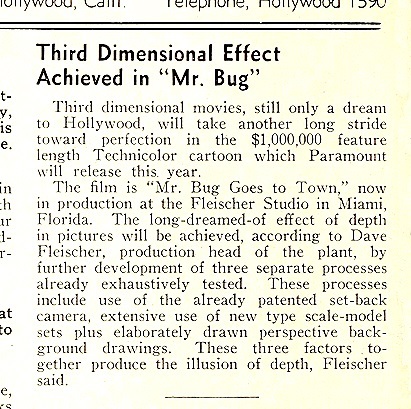 With a budget of $1,000,000, and a production schedule that - from final script approval to finished product - was less than a year, the making of Mr. Bug Goes to Town was an incredible feat involving more than 700 staffers - including writers, animators, inkers, opaquers, musicians and camera technicians. In Part Two,​​ we look at the actual making of Mr. Bug Goes to Town, and how - working in an era during which every element, from individual animation cells to dimensional background sets, had to be precisely and painstakingly created by hand - the staffers of Fleischer Studios made use of innovative techniques and ground-breaking inventions (many of which they themselves had developed) to bring this beautiful film to life. 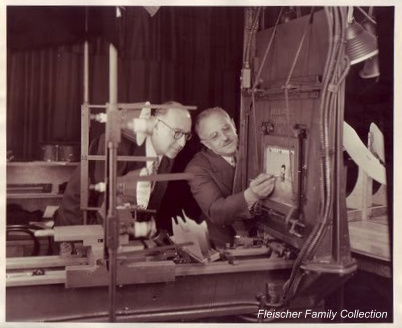 The spectacular opening credits of Mr. Bug were created using Max Fleischer’s patented ‘set-back’ process. Not only did it offer the viewer a stunningly realistic sense of dimensionality, it also created the illusion of actually moving through space. 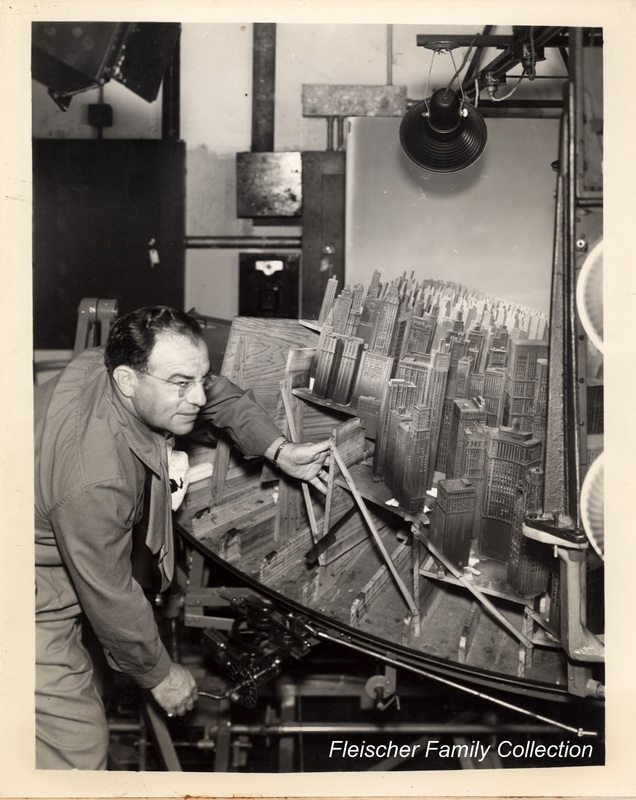 Director Dave Fleischer turns the crank on the ‘set-back’ model built for the film's opening scene. In order to achieve this, an actual three-dimensional set, in miniature, was built on top of a revolving steel turn-table. The set was constructed in distorted perspective which served to enhance the illusion of three-dimensional space. Using a specially designed camera, animated drawings were then placed 6 feet in front of the camera and photographed one at a time, with the ‘set’ in the ‘back’ being moved very slightly each time another drawing was photographed. The set of New York City featured in the opening credits of the film was made of painted balsa wood and plastic. Although this breath-taking opening sequence takes less than two minutes of screen time, it took Fleischer artists four months to construct and shoot it. 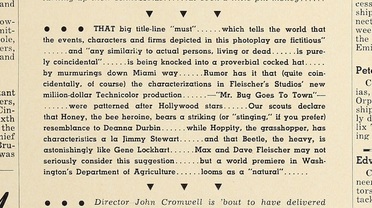 As the article (left) from Showmen’s Trade Review (April 26, 1941) demonstrates, there was great excitement within the industry surrounding the Fleischers' use of this 'set-back' process, which was viewed as a significant step forward in Hollywood's ambition of achieving a fuller sense of dimensionality in film. 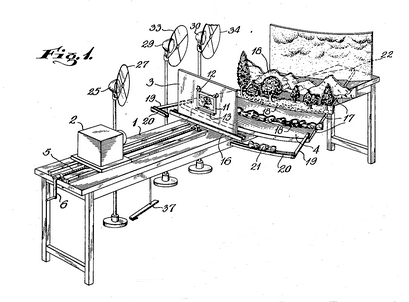 Drawing from Max Fleischer’s patent application for what came to be referred to as ‘The ‘set-back’’ or ‘The Slide.’ The 3D set in the rear serves as a background, with celluloid drawings (‘cels’) placed on the stand in front of it. A movie camera is located in front of this set-up. As ‘cels’ are changed (to show the action), the set in the background is also moved very slightly. 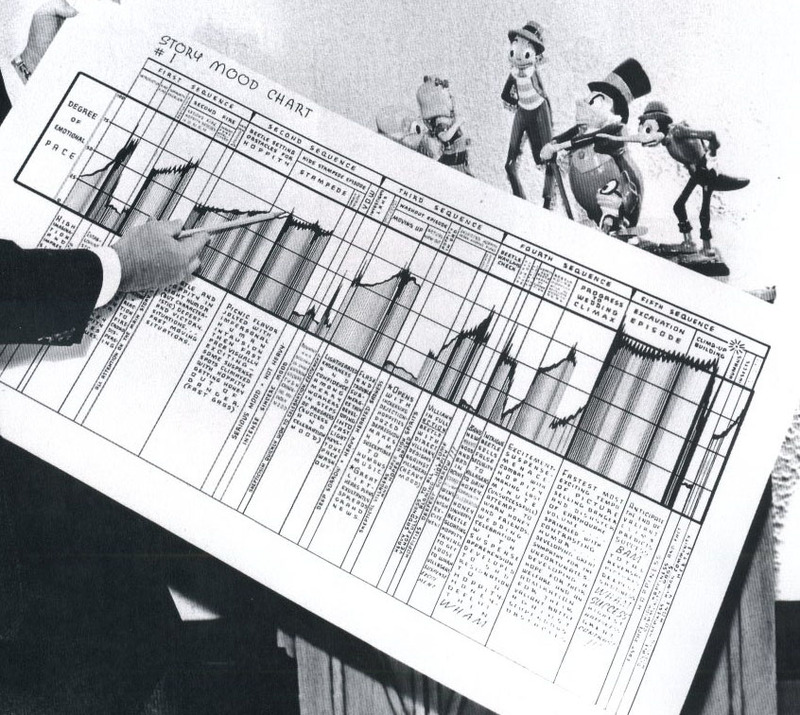 The 'set-back' process enabled Fleischer animators to achieve a stunning degree of dimensionality. 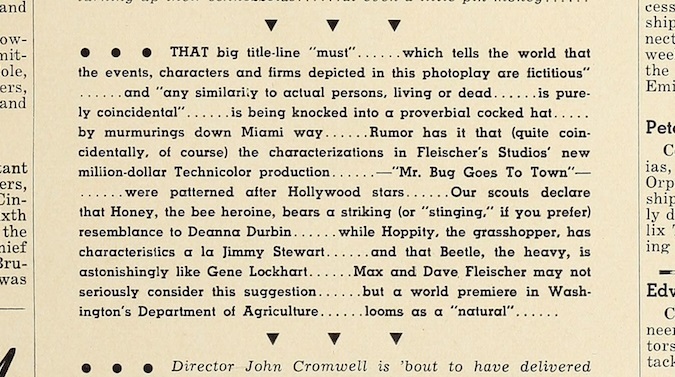 Article from Film Daily speculating on which popular film stars the characters in Mr. Bug might be patterned after. Film Daily February 11, 1941. April 26, 1941: Showmen’s Trade Review reports on several processes the studio will use to heighten the 3D effect in the film. Staff animator Reuben Grossman monkeys around with Honey Bee. Film footage courtesy of the Lynn and Louis Wolfson II Florida Moving Image Archives. Since many different animators might be doing drawings of the same character, it was necessary to have guidelines, or standards, so that each character- no matter who drew it- would always look the same. 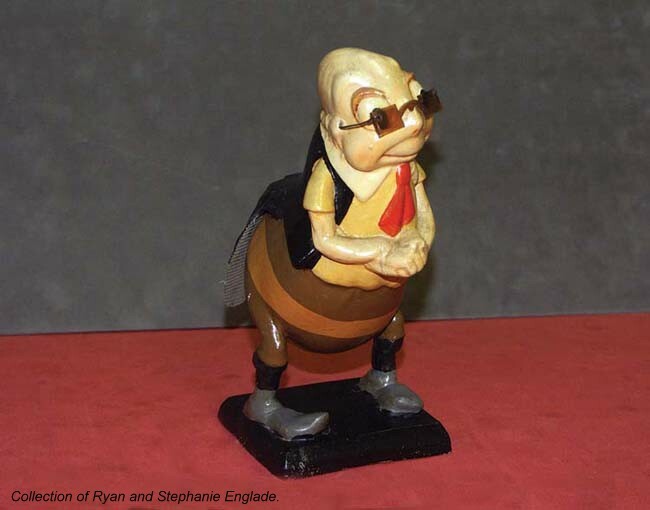 By the time Mr. Bug was made, it had become standard practice in animation to develop model sheets for each character in a film, like the one of Honey Bee featured here. ​A ‘maquette’ is a small sculpted statue of an individual character. These ​maquettes served as a kind of three-dimensional version of model sheets, giving animators a fuller sense of the character's actual physical presence in space. Just several inches in height, these small sculpted pieces were created in limited numbers. Only a few, including the maquette of Mr. Bumble (left), have survived. 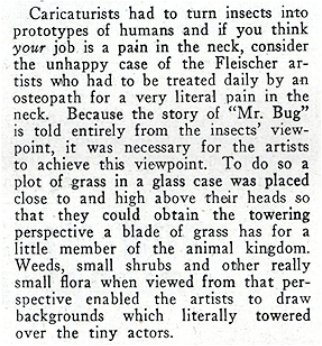 For Mr. Bug the Fleischers went a step further and created human-sized models of the film's main characters. In addition to enhancing the animators’ sense of these insects as fully-realized, multi-dimensional characters, they appear to have provided the staff with some fun and very entertaining opportunities. This playful clip (left), from one of the animator's home movies, was shot just outside the Studios' Miami home during the making of Mr. Bug. 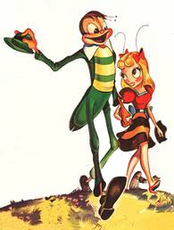 Another of Max Fleischer’s inventions, the Rotoscope, was used to create the illusion of fluid, naturalistic motion for the human characters in the film. The ‘human’ sequences in the movie were actually first filmed using live actors so that animators could study their movements frame-by-frame. 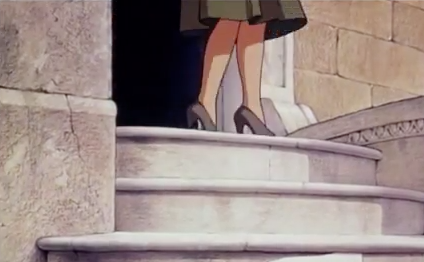 Then, using the Rotoscope, they create their drawings based on the filmed images. Find about more about the Rotoscope in our Rotoscope exhibit. It is interesting to note that while the movement of the humans is extremely naturalistic, they are always seen from an insect’s point of view. 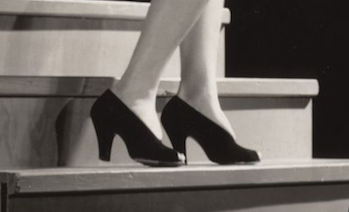 Humans in this world tend to be made up chiefly of enormous feet or an occasional arm, and, except for one brief scene at the film’s beginning, the heads of ‘the humans’ are never seen. In addition to all the other tools they had at their disposal, the artists of Fleischer Studios also had their own faces. In the image (left) animator Graham Place examines his face in the mirror and tries to look like a lovelorn girl as he draws the character Honey Bee. 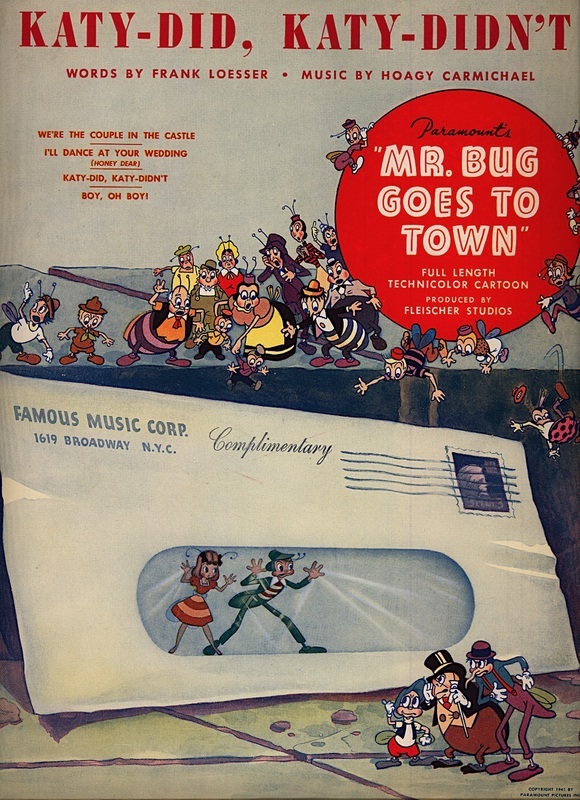 As in all Fleischer films, music played a central role in Mr. Bug. Two very well known song writers, Frank Loesser and Hoagy Carmichael, along with long time Fleischer staff composer, Sammy Timberg, wrote the words and music for the songs. For Loesser and Carmichael, already well known for their extensive work on Broadway (Loesser) and in popular music (Carmichael), working on an animated film was a somewhat unusual assignment. Together, the three provided the film with a musical score that included such well known songs as Mr. Bug, Be My Little Baby Bumble Bee, and We’re the Couple in the Castle. Background and atmospheric music is credited to Leigh Harline. 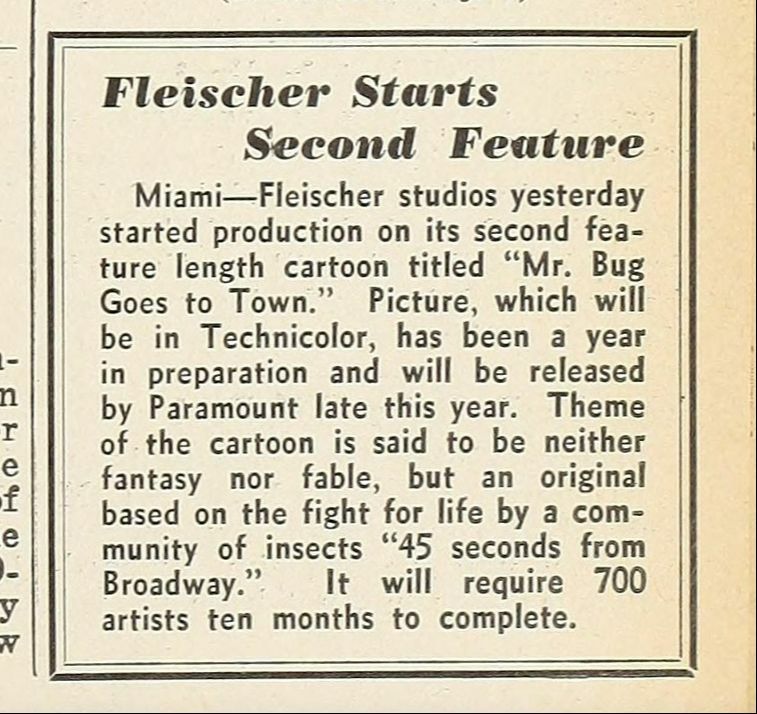 We hope you enjoyed this glimpse into just some of the challenges and opportunities that Fleischer Studios faced during the making of Mr. Bug Goes to Town. Watch for the next installment! In Part Three we'll share the surprising story of Mr. Bug and its opening! Covering the 116 main artists, it also contained an extra double indemnity clause in the event one of them should lose one or more fingers while working on the film! 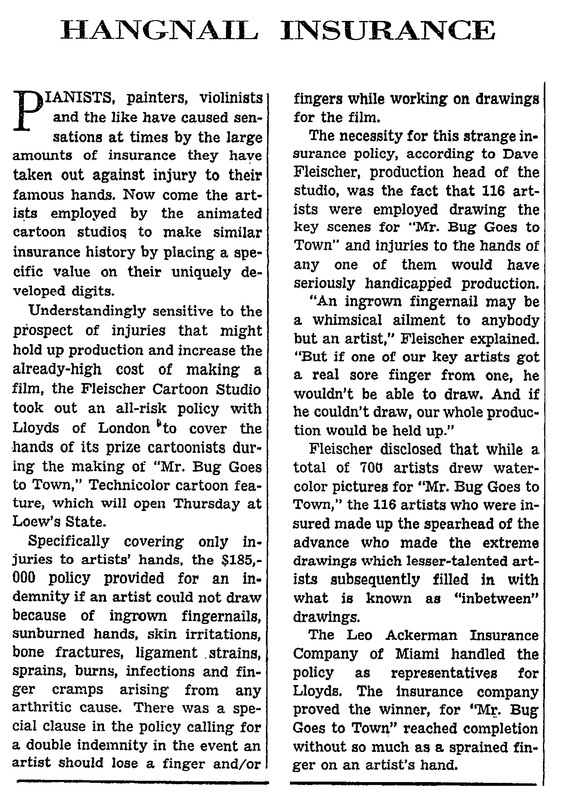 As the Times points out, the Fleischers were “understandingly sensitive to the prospect of injuries that might hold up production and increase the already-high cost of making a film." Fact #2 - Who's that bug? Jack Mercer, the talented voice artist who provided the voice of Popeye the Sailor also gave the character of Mr. Bumble his voice. 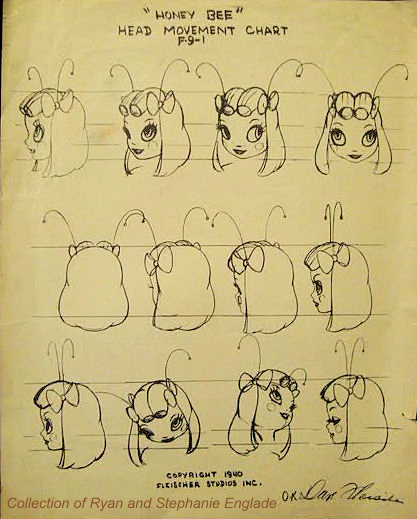 The studio developed a ‘Story Mood Chart’ for Mr. Bug to help artists better understand, sequence by sequence, the emotional pace of the film. It shows the ‘Fifth’ and ‘Sixth’ sequences as emotional high points. ​Though not the only studio to create such a chart, it was an unusual project to undertake at this point in time.